," which means you can find it on the top half of the first page — the bottom half is folded behind and isn't readily seen when you first look at the newspaper. The same concept applies to browsers as well. There's no clear line for "above the fold" on a browser — there are many different sizes of monitors, browsers are not always full screen and other things like toolbars can take up space. Consider a "Donate" button on a non-profit site. If it's far down the page, you may not see it when you first view the page. You can of course scroll downwards, but many people don't scroll and will miss it entirely. For example, on the download page for Google Earth, the install rate increased by 10% when we moved the "Download" button 100 pixels upward. We can attribute that increase to users who wanted to try out Google Earth, but didn't see the button before. To help you understand how everyone sees your website, we created a tool called Browser Size in our 20% time. Browser Size is based on a sample of data from visitors to google.com. Special code collects data on the height and width of the browser for a sample of users. 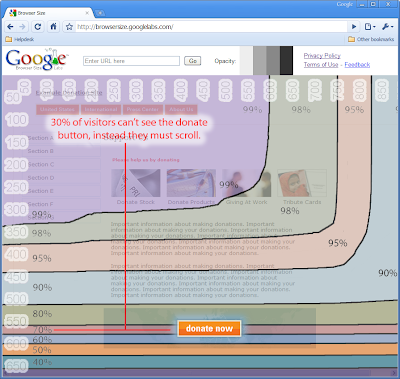 For a given point in the browser, the tool will tell you what percentage of users can see it. For example, if an important button is in the 80% region it means that 20% of users have to scroll in order to see it. If you're a web designer, you can use Browser Size to redesign your page to minimize scrolling and make sure that the important parts of the page are always prominent to your audience. We hope people will use this tool to make their websites better, in turn making the web better for everyone. If you're interested in learning more about Browser Size, check out our post on the Google Code Blog. In a newspaper, the most important story is featured on the front page. If it's a really important piece, then it's placed "above the fold," which means you can find it on the top half of the first page — the bottom half is folded behind and isn't readily seen when you first look at the newspaper.